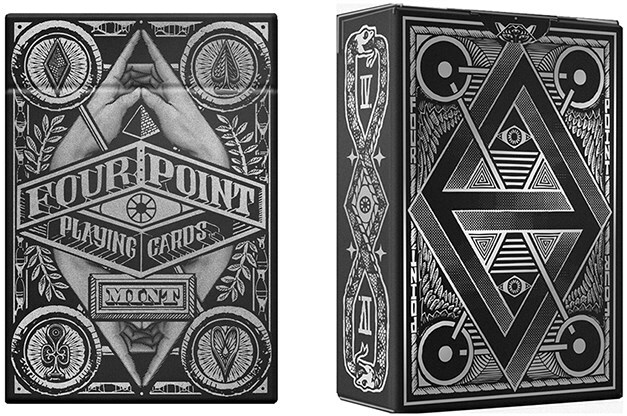 We're thrilled to be able to offer you these stunning hand illustrated first edition deck from Four Point Playing Cards. Funded and made possible through Kickstarter in 2014, with the generous support of 473 wonderful backers, this exquisite deck is now available in a limited run. Illustrated by hand in charcoal and ink, this unique deck features original suits, court cards, jokers and 2 bonus gaff cards. Printed in green, black and metallic silver inks on a parchment field, using high quality Bicycle-grade paper with an embossed finish, with each deck sealed in cellophane. The deck has been designed in San Francisco, California and manufactured in the U.S.A. by the United States Playing Card Company. Please note: Limited edition of 2,500 decks.